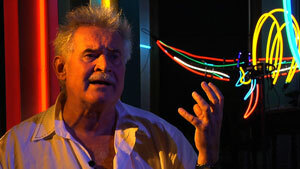 Keith Sonnier moved to New York City in the 60′s and began a long association with Leo Castelli Gallery. Sonnier was awarded a Guggenheim Fellowship in 1974 and NEA grants In 1975 and 1981. He has completed installations and large-scale projects around the world and has had solo exhibitions at museums throughout the world, including the Whitney Museum of American Art, the Museum of Modem Art, the Hara Museum of Contemporary Art (Tokyo), the Musee National d’Art Modern, Centre Georges Pompidou (Paris), the Museum of Contemporary Art (Los Angeles) and the Contemporary Arts Center (New Orleans). Museums such as the Fogg, MOMA, the New Orleans Museum of Art and the Whitney have Sonnier’s work in their permanent collections. Since 1997, Sonnier has been represented by Marlborough Gallery in New York City.